Earlier we told you about getting 50 free business cards from PrintVenue. We also stumbled upon an offer where Moo.com is providing you with 50 free printed business cards. These are designed with unique images as the background. You can have 50 unique images on 50 different cards. Isn’t the idea of having different backgrounds on your visiting cards amazing? The only LIMITATION to this is that you need to have a Facebook account and should have timeline profile enabled. If you don’t have timeline you can go to this link. 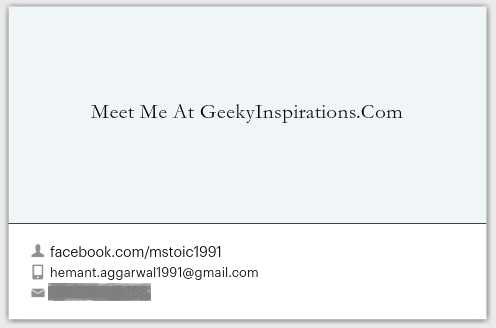 REMEMBER Your Facebook covers act as your background photos on your Business Cards. You need to go to your “Profile” tab and below your profile image you will have a link to your about me page, written as “About”. Click on it and now scroll down and you will see a column where “Contact Info” would be written. On the right side you will have a small image, hover over it and you will see something like this. 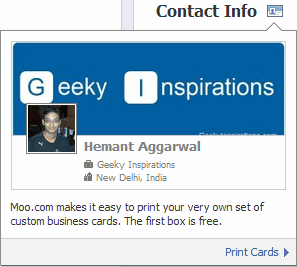 Now click on “Print Cards” and you will be taken to Moo.com. Here you can customize your card’s front and back and choose which backgrounds you want on your visiting cards. They give 5000 free cards daily. That means free business cards to 100 people. And if you approach them after that, they show you a message that the cards are finished. If you get this message you can try the next day. I was lucky and got it at the first go. Also you will have equal number of cards with the same background. This means if you choose 5 cover photos then you will get 10 cards each having the same background. 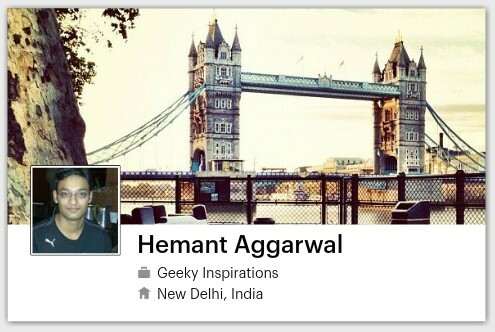 REMEMBER You need to have a timeline enabled Facebook profile. Have cover photos to be chosen as the background. As the previous offer, the cards are free but you will be charged for shipping. When I ordered it in India, I was billed Rs 275. Technically i have to spent 275 for the cards. In mean time i can go for a walk on market and they can give me 100 best quality card in 200 rs/- . Facebook card is not a worthy thing to invest ! ! May be you are somewhat right. But if you take quality into consideration then I think the quality of these cards would be far better than the cards you will get here.